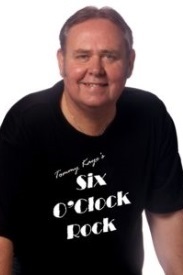 Tommy, from Adelaide, South Australia is the Founder and Director of RadioKSA and the host of Six O’Clock Rock. He was a fan of radio and fell in love with music in the 60’s when The Beatles came to town in 1964. He spent his working life as an electronics engineer, but now as an accomplished and experienced announcer, MC and actor, who prefers to spend his time with his wife (an established painter/artist), along with his thousands of CD’s, LP’s and countless 45’s! Six O’Clock Rock, a successful radio program in Adelaide, South Australia for almost 15 years, also became a popular dance attraction at many local venues. Tommy became the Patron of “Club Slick” part of the Down Syndrome Society as a result of his support for many groups catering to the disabled. He started the RadioKSA concept in 2012, and invites you to enjoy the style of radio that changed his life, the 60’s and 70’s.